Cantankerous animals that are very large and prone to charge… are best given a wide berth! Any animal can be dangerous if surprised or provoked, but those that unpredictably go out-of-control by their very nature are the most perilous. Encountering animals in the wild is a rich and exhilarating experience. The beauty and grace of each species is fascinating and unique, with temperaments and behaviors dependent on the individual animal. When encountering any creatures in the wild, no matter what their size, it’s always best to observe them with care. Be cautious if they are in close proximity, and try not to startle or disturb them. This is even more important with those large, strong animals that are known to have an irascible nature! These 5 wild animals are some of the most dangerous found in the world. They can demonstrate an outright belligerent and aggressive nature, and they are unpredictable. They are known to go out of control at any time, and that’s particularly true when they see a stranger in their territory. People are continually fascinated by animals, but this uncontrollable type of behavior can be quite disturbing. So many people in today’s world are conditioned to safe, human dominated environments where actual wild animal experiences are mostly missing. But when the opportunity arises to venture into the great outdoors it’s a good idea to be familiar with the kinds of animals you may encounter… and their natural behaviors! The Hippos Hippopotamus amphibius are ferocious animals and are very aggressive by nature. They are considered to be one of the most dangerous large animals in Africa. 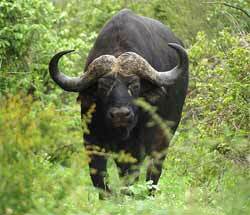 Mature bulls tend to be very territorial and are indiscriminately ill-tempered towards anything they come across. The females are very protective of their young. 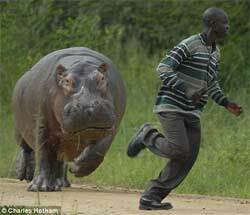 Hippos are very aggressive towards humans and have killed more people in Africa than any other wild animal. They will attack people both in boats and on land. There is often no apparent provocation but in many cases attacks happen when the animals are disturbed or harassed. Hippopotamuses are very large, landing in third place as the heaviest land mammals after Elephants and the White Rhinoceros. They can weigh up to 4,000 pounds (1814 kg) and reach up to 17 feet (5.18 m) in length. The name Hippopotamus is Greek meaning ‘river horse’ and they can remain submerged for up to 5 minutes. Most of their aggression takes place in the water. They have a huge gaping “yawn” that serves as a threat display. Their long, thick canine teeth are used to block an attack from another hippo and inflict injury, and they can bite a boat in half. Rhinoceros are members of the family Rhinocerotidae. Rhinos have very poor eyesight so they rely more on hearing and smell. They are solitary in nature, coming together only for mating, yet they are not very territorial with their own kind. With humans and other creatures however, they are notoriously edgy and protective of their young. If they perceive something or someone in their territory they are quick to charge. Rhinoceros are so defensive that they have earned the reputation of being indiscriminate attackers. Their large heads have strong horns which lead a head-on charge. Combine this with their edgy nature and poor vision, and you have powerful animals that will indiscriminately attack any moving thing. Of the two kinds of Rhinoceros in southern Africa, the White Rhinos are the second largest land mammals, just behind the Elephants. They can reach up to 5,000 pounds (2268 kg). The Black Rhino is much smaller, not quite half the size of the White Rhino, coming at 2420 pounds. 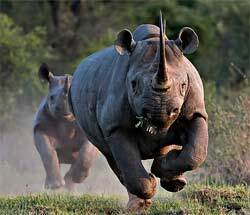 The black rhino is the more dangerous of the two. It has the reputation of being extremely aggressive and will readily charge at perceived threats. The white rhino is less aggressive but is also very dangerous. 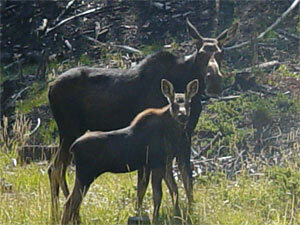 The Moose Alces alces are the largest species in the deer family, but they are not reserved like their many cousins. They have injured more people than any other wild animal in the Americas, and worldwide are second only to the Hippopotamuses. Moose are known to attack more people than bears and wolves. In fact, they fully capable of killing bears and wolves! Moose are most aggressive during their fall mating season. That’s when the Bull Moose has high hormone levels. But cows with calves are also very protective and will attack anyone who comes too close, or comes between mom and her babies. These are good sized animals. 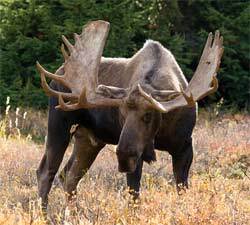 The largest adult moose can stand up to 7 feet (2.1 m) at the shoulder. Bulls can weigh up to 1,540 pounds (700 kg) and the antlers can span up to 6 feet (1.8 m). Although they are not usually so aggressive, if provoked or frightened a Moose will respond. They are very limber, have highly flexible joints, and their hooves are sharp and pointed. Besides charging they are capable of kicking in all directions, including sideways. They will often give warning signs before charging. When they maintain of eye contact, that is the first sign of aggression. They are definitely agitated if they have laid-back ears or a lowered head. Then if the hairs on the back of their neck and shoulders stand up, they have raised their “hackles” and a charge is most likely imminent, so be prepared! 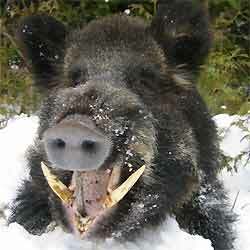 Wild Boars Sus scrofa are very dangerous animals if they attack. They are extremely aggressive with an unpredictable nature, and are very smart. They are considered the 4th most intelligent animal on the planet! These wild hogs are large animals, weighing up to 660 pounds (299 kg), and are equipped with thick, razor sharp tusks. They have a long history of association with humans. In fact, they are the ancestors of all domesticated pigs. Through human intervention they have been spread across much of Eurasia, North Africa, and many parts of Indonesia. Wild Boar attacks on humans are fairly rare, but very serious, and typically occur during the rutting season from November to January. They attack by charging a victim with their tusks. After the first attack, a boar will fall back and prepare to attack again if the victim is still moving. It will repeatedly attack until the victim is completely disabled. Most injuries to humans occur on the thigh region. These African buffalo Syncerus caffer are called the “Black Death” or “Widowmaker” and are widely regarded as extremely dangerous. With a charge at approximately 35 mph (56 kmh), they reportedly gore and to kill over 200 people each year. They are very precarious when they are disturbed, becoming most aggressive when they perceive a threat to one of the calves in the herd. They will engage in a “mobbing behavior to fight off predators. Lone bulls that have been hunted or wounded are also highly dangerous, and are known turn back on their own tracks to ambush and attack their pursuers. Their very unpredictable nature makes them exceedingly dangerous to humans, so they have never been domesticated. But although they are irascible in temperament, they are impressive creatures. These buffalo are quite robust with a very stocky body on short thick legs, making them heavier rather than tall. In length the largest specimens can reach up to 11.2 feet (3.4 m) with a shoulder height up to 5.6 feet (1.7 m). They can weigh up to 2,010 pounds (910 kg), placing them at the 11th spot of the heaviest land mammals. Their heads are topped by a bone shield fused with long curved horns on either side, a total width of around 10 feet (3 m). They may charge without provocation and can seldom be stopped. Even bullets will not always penetrate this dense helm. There are all sorts of unique animals in our world, each with its own talents. Visit the Animal-World.com website to learn about all sorts of critters! Clarice Brough is a team member at Animal-World and has contributed many articles and write-ups.